These röstis work well as a starter and as party food too – serve alongside your celebratory party fizz. 1 Bring a saucepan of water to the boil, add the potatoes and boil for 5 minutes (no need to peel them first). Rinse in cold water to cool the potatoes. Coarsely grate into a large bowl and stir in the fennel seeds, shallots and seasoning. This can be prepared a day ahead. 2 Drain the artichokes, reserving 3 tbsp of the oil. Stir 1 tbsp oil into the potatoes. Heat another 1 tbsp of oil in a large frying pan. Place a 5cm round cookie cutter in the pan and put a heaped dessertspoon of the potato mixture inside the cutter. Pack down firmly with the back of the spoon. Carefully lift away the cutter and make more rösti circles with about half the remaining mixture, spacing them slightly apart. Fry for 5 minutes on each side until golden. Transfer to a baking parchment-lined baking sheet and fry the remaining mixture in the same way using the remainder of the oil. 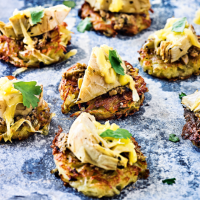 3 Spread a scant ½ tsp of the tapenade onto each rosti and top with a piece of artichoke. Sprinkle with the mozzarella, cover loosely and chill until needed. 4 To serve, preheat the oven to 180°C, gas mark 4. Bake the rösti for 10 minutes until heated through. Garnish with coriander sprigs. For a non-vegan version, use regular Parmigiano Reggiano, finely grated on top. This recipe was first published in Thu Nov 30 12:08:00 GMT 2017.